Fulton From the Ground Up | Don’t move that firewood! With all this cold damp weather, the main thing on my mind is getting home and starting a nice warm fire. However, whether you get your firewood from a local source, or your own backyard, it could be a host to any number of invasive insects. 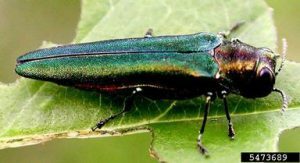 For this reason, Georgia and many other states regulate the transport of firewood to prevent the spread of these pests. Before you go on that winter camping trip or bring your firewood to another location, make sure you are aware of the regulations and potential risks this can pose. It is always best to use locally harvested firewood. Though the term “local” seems a little vague, a good rule of thumb is to keep firewood within a 50 mile radius of its origin, or within county lines when possible. Currently, Georgia has several quarantine zones for pests, as do other states. It is illegal to move firewood into or out of these zones, so think twice before loading up your camper with wood even if you don’t see holes or sawdust on it. counties added, meaning the spread of the insect had slowed. There are also monitoring programs in place for insects that may pose a threat to our forests but have not yet been detected in Georgia. 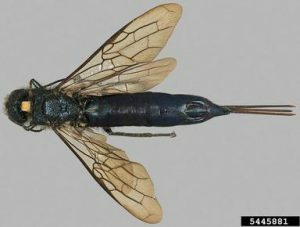 The sirex woodwasp is an invasive wasp that lays its eggs in the trunks of pine trees. Along with the egg, it also injects a fungus, which the larva eats. This fungus infects the tree and prevents nutrients and water from flowing adequately through the tissue. This eventually leads to the death of the tree. 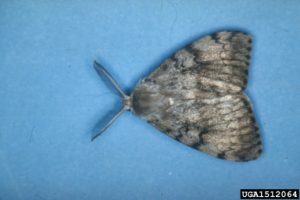 The gypsy moth is a widespread problem in the Northeastern United States. These insects were originally imported to be farmed for silk, but they quickly infested large stands of trees. Unlike our webworms and tent caterpillars, the extent of defoliation caused by gypsy moth caterpillars can often kill whole stands of trees. 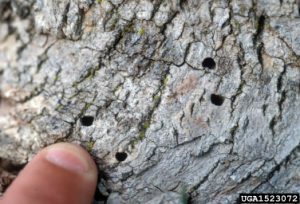 While the EAB and sirex woodwasp, which are transported in the larval stage, gypsy moths lay their eggs on the bark of trees. These eggs are then moved with the firewood when the tree is cut down and relocated, infesting a new area. We have excellent monitoring systems in place to ensure that we can detect the spread of new pests. However, campers and travelers will still move their firewood with them across state and county lines, bringing insects and diseases with their load that will infect healthy areas. By using local wood, or heat treated wood, we can decrease the risk of new infestations . Posted in Conservation, Entomology, Pest, Urban Forestry. Bookmark the permalink. 9/28 Friday Free For All!